"Let's Have A Little RENT TALK System" is a MUST for every investor to properly introduce each new resident to YOUR property management program. You will use the Rent Talk System BEFORE You Give Them Keys To Your Precious and Very Valuable Investment. 11 minute Tenant Orientation and Training DVD to show every new tenant BEFORE you give them the keys! * Brand new Rent Talk FAST START DVD shows you exactly how to use this system. Your Fast Start DVD video allows you to delegate this entire process to your trusted staff member. *38 Page Rent Talk Pages for your own flip Chart in PDF format are on your Fast Start CD. Simply print the pages and insert in any 3-ring binder. You can even add your own additional pages or remove a couple of mine to create your own customized verbal presentation as a "Plan B" or to use when a DVD player is not available. *Fast Start Chart is your cheat sheet to make sure all is in order for the very first meeting and orientation with new resident. *Welcome Checklist for Your New Resident Place this friendly one-page sheet on a clipboard for your new resident to check off and initial each step in your process. *Powerful Office Checklist Form for your use to ensure that you have got everything in you need done, right down to the smallest detail, when placing a new resident into your investment property. Rent Talk DVD - "Let's Have a Little Rent Talk DVD System" 11 minute DVD - is a short, power packed video to introduce each new resident to your program and real estate business. ->When they do this consistently for 36 months they will earn a free month rent, but only when they sign up for another 36 month lease! ->Would you give up one month rent to keep a great tenant for 6 years or more? The ALL STAR MEMBER REWARDS PROGRAM is based on the original landlord superstar - Mr. Landlord's 3 Star Resident Program! Thanks Jeffery! This is a MUST Show video to every new resident before they sign any rental agreement and BEFORE You Give Them Keys to Your Investment Property. The Rent Talk DVD is short and very powerful and shows your new residents what is expected of them along with the consequences for their failure to be responsible. Along with all of the penalties for bad behavior, your new tenants get introduced to your Brand New All Star Plan, it's a Resident Reward program just like the airlines and credit cards. Rent Talk Checklist Form for your new resident properly documents each step in this very ant procedure of bringing on a new resident. The Rent Talk DVD System Works! There are huge hidden benefits for you with the "Rent Talk DVD." Think about it, now you are creating your own "system" to be fair to every applicant, resident and more. Imagine a grumbling resident saying "you never told me this or that." You have nipped this in the bud because every new resident must view your "Rent Talk DVD" and they must sign and initial your "I Have Viewed The Rent Talk DVD Video Form." Your Rent Talk System Pays For Itself Over and Over! Especially When A New Resident Discovers You are Serious about your business. Just imagine almost never having a problem tenant again! How much money have you wasted on dealing with problem tenants, late charges, damages, evictions and more. Nip It In The Bud Now. Sit back, enjoy, and appreciate a great new simple tool which becomes part of your "system" and procedures. Now you are well on your way to having a rock solid, fair, procedure used for all new tenants. All of your new tenants watch this short, powerful video before you give them keys to your investment property! SPECIAL NOTE Mike Butler was one of the featured instructors at our latest MrLandlord.com National Convention. This is a special post-Convention offer. MrLandlord.com has made special arrangements to guarantee this limited-time only introductory offer. This offer will automatically expire when these are sold out. 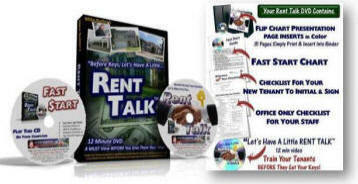 Grab your Rent Talk DVD System before they are gone!